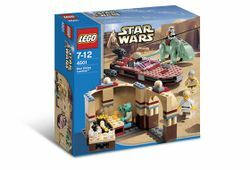 Mos Eisley Cantina is a Classic Star Wars set released in 2004. It includes 193 pieces that can be used for assembling a landspeeder, a dewback, a cantina, and five minifigures; Han Solo, Greedo, a Sandtrooper, Luke Skywalker, and Obi-Wan Kenobi. The cantina is built on three baseplates. One of them has an open doorway that can hinge with a light beige orb on the top, another has a small table with a drink container and a cup that can also hinge away from the main part, and the third baseplate has a table and seats as well as a wall. The wall connects the other two baseplates on at the bottom sides. Two quarter-circle pieces build up most of it, but there as also some other bricks on each side of the quarter-circle pieces. The middle pillar between the two quarter-circle pieces has another light beige orb on it. The cantina is built mainly out of sand pieces, but also has maroon and light grey ones throughout. Speeder The speeder is built mostly out of maroon and light maroon pieces. The speeder has a semi-circle front in front of another front section with some bendable pieces acting as pipes. At the back of the long hood is a transparent white glass, which behind that are two seats and the controls. On either side of the the seats is a low wall/armrest. Behind the seats in a section that has the three engines connecting onto it–one at the top, and one on each of the sides. Trying to get to Alderaan to give the plans to the rebels leaders there, Obi-Wan Kenobi and Luke Skywalker go to Mos Eisley Cantina to find a ship transport. There they find Han Solo, a smuggler who has a bounty on him, to take them to where they need to go. Luke sells his speeder for money to get to Alderaan. On the way, Sandtroopers, the Empire's sand troops, try to stop them. On Tatooine, the Sandtroopers ride dewbacks for transport across the desert terrain. This was the first set released depicting the scene at the Cantina. This is a description taken from LEGO.com. Please do not modify it. Find action and danger at the Mos Eisley Cantina™! Build the most popular spot on Tatooine—the Mos Eisley Cantina™! You'll see Luke Skywalker™ and Ben Kenobi™ in their landspeeder, an Imperial Sandtrooper on his reptilian Dewback, and Han Solo™ meeting with Greedo. Good thing Luke has his Lightsaber hidden in a secret compartment! Combine this set with #4477 T-16 Skyhopper and #4480 Jabba's Palace to recreate Tatooine from Star Wars™: Episode IV A New Hope. Facts about "4501 Mos Eisley Cantina"
Find action and danger at the Mos Eisley Cantina™! This page was last edited on 12 January 2018, at 18:22.